Died 1824. He was the third son of John De Courcy, 18th Lord Kingsale, and of his wife, Martha Heron. On 20 November 1776 de Courcy was commissioned lieutenant of the Preston 50, Captain Samuel Uppleby, flying the broad pennant of Commodore William Hotham in North American waters, and he remained with her until transferring to Vice-Admiral Lord Howe’s flagship Eagle 64, Captain Roger Curtis, in April 1778. He was promoted commander on 20 August 1782 and briefly had the Lightning 14 at Spithead before commissioning the newly purchased sloop Swallow for service off Ireland. Upon being posted captain on 6 September 1783 de Courcy joined the Europa 50, going out to become the flagship of Vice-Admiral James Gambier at Jamaica two months later. He held this command for but a short while into the following spring when Rear-Admiral Alexander Innes took her for his flagship, whereupon he exchanged with Captain Edward Tyrrell Smith into the Nemesis 28. which he brought home to pay off in May 1784. From 1785 through to 1788 he had the Hyaena 20, in which vessel he escorted the ‘First Fleet’ destined for New South Wales out of the Channel in May 1787, whilst also serving on the Irish station in the Preventative service. In June 1793 he commissioned the thirty year-old twelve-pounder frigate Pearl 32 for service on the Irish station, and in September 1795 was appointed to the ex-64 Magnanime, which had been cut down to a 44-gun ship the year before. In March 1796 he sailed with the West India convoy from Cork before returning to the Irish station. During his period in command he was to take a host of enemy privateers, including the Triton 8 off Cape Clear on 22 June 1797, the Tiercelet 8 on 15 August, Eugénie 18 on 16 March 1798, Audacieux 20 on 2 April 1798 and Colombe 12 on 16 August 1798. A week later, whilst in company with the Naiad 38, Captain William Pierrepont, he chased the French Décade 36 off Cape Finisterre, but it was his consort which caught the Frenchman and forced her surrender, the prize being sent into Plymouth. On 12 October 1798 the Magnanime was present under the orders of Commodore Sir John Borlase Warren during the chase of Commodore Bompart’s squadron of one sail of the line and nine frigates off Ireland, and she engaged both the Embuscade 36 and Coquille 36 before receiving the surrender of the former after she had been badly damaged by the Foudroyant 80. During this action de Courcy’s vessel was also disabled. In February 1799 he was appointed to the Canada 74 in the Channel, and then forming part of Rear-Admiral Sir Charles Cotton’s reinforcement which was sent out to join the Mediterranean fleet following the breakout of the French fleet on 25 April. In June 1800 he joined Commodore Sir Edward Pellew’s squadron which was despatched to launch a French Royalist uprising from Quiberon Bay, and when the Mars 74, Captain Robert Lloyd, was damaged off the Black Rocks on 10 April 1801 he towed her into Plymouth. During his time in the Canada the quarterdeck and petty officers were predominantly Irish and he kept the ship in what was described as ‘an admired disorder’. With the renewal of hostilities de Courcy commanded the Plantagenet 74 from August 1803, and in early 1804 he received great praise for remaining with his single ship in blockade off Brest, one newspaper even reporting that for so doing he deserved to be accorded the honour enjoyed by an ancestor of wearing his hat in the Royal presence. Shortly afterwards the greater number of the Plantagenet’s sails were torn asunder in a gale and she returned to Plymouth to refit, and after being repaired she escorted the East India trade as far as St. Helena in early 1804 before returning with some of the China trade in August. He was next appointed to the St. George 98 in November 1804, in which he went out to the Leeward Islands with Rear-Admiral Hon. Alexander Cochrane’s squadron in April 1805, being based at Jamaica during the early stages of the Trafalgar Campaign. At the end of July he was despatched to join Vice-Admiral Lord Nelson’s Mediterranean fleet which had arrived in the Caribbean in chase of the allied fleet, although in the event a hurricane prevented this union. De Courcy was promoted rear-admiral on 9 November 1805, and from the spring of 1807 flew his flag aboard the Tonnant 80, Captain Richard Turner Hancock, after replacing Rear-Admiral Eliab Harvey in command of a squadron serving off Cape Finisterre. He was due to hoist his flag aboard the Prince of Wales 98, Captain Thomas Byam Martin from May, but in the event this vessel was taken in July by Admiral Sir James Gambier as his flagship for the Copenhagen Expedition. In June 1807 he brought his squadron into Plymouth from a cruise off Cape Finisterre before sailing to keep a watch on Rochefort in the brief absence of Rear-Admiral Sir Richard Strachan. Remaining with the Tonnant thereafter, she formed part of Vice-Admiral Sir John Duckworth’s fleet which engaged in a thirteen thousand mile search of the Toulon fleet after it had broken the blockade on 7 February 1808. 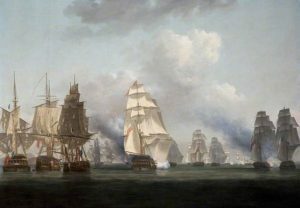 In May 1808 he formed a squadron of seven sail of the line and two frigates at Plymouth which were due to undertake a secret mission, and by August the Tonnant was at Corunna where de Courcy was received with military honours and banqueted by the Spanish junta, and where his squadron remained in support of the Army. Serving under the orders of Rear-Admiral Sir Samuel Hood, de Courcy superintended the embarkation of Major-General Sir John Moore’s army following the Battle of Corunna on 16 January 1809. In March 1809 de Courcy set out from Plymouth aboard the Diana 38, Captain Charles Grant, and he arrived at Rio de Janeiro on 2 May to relieve Rear-Admiral Sir William Sidney Smith of the command of the squadron off Brazil, even though the latter was not aware of his recall. De Courcy acted with decorum and tact throughout an ensuing dispute and managed to remain on good terms with the flamboyant Smith, but it was only on the 18th, and with the support of the British ambassador, Lord Strangford, that he assumed command and shifted his flag to Smith’s flagship Foudroyant 80, retaining Captain Hancock. On 16 June he arrived to parade off the Rio de Plata in search of a French squadron from Lorient, his squadron consisting of the flagship the Elizabeth 74, Captain Hon. Henry Curzon, Bedford 74, Acting-Captain Adam Mackenzie, Agamemnon 64, Captain Jonas Rose, Mutine 16, Commander Charles Fabian, and Mistletoe 10, Lieutenant Robert Ramsey. Finding no sign of the French he returned to Rio, but not before the Agamemnon had been lost off Montevideo. He was promoted vice-admiral on 31 July 1810, and he returned to England in December 1812 aboard the Foudroyant 80. De Courcy was advanced to the rank of admiral on 19 July 1821 and he died on 22 February 1824 at his seat of Stoketon House, Saltash. He married Anne Blennerhasset of Castle Conway, County Kerry on 24 October 1786 at St. Thomas, Winchester, and of his family his eldest son, Michael, entered the Clergy and his daughter, Anne, married Captain Sir John Gordon Sinclair. His niece married Vice-Admiral Sir Charles Dashwood, whilst another son, Captain Nevinson de Courcy commanded the Mutine under his orders in South America. A grandson, Michael, also served in the Navy and reached the rank of commander. His nephew, John Meade, born in 1782, served with him on the Magnanime and Canada, and was promoted commander in 1812, having served as his flag-lieutenant on the Tonnant, Diana and Foudroyant. De Courcy was a sound officer, and in stark contrast to his predecessor Smith he preferred the company of his squadron afloat to the court ashore in Rio. He was described as being of ‘real Irish character’, and this was reflected in the behaviour of his mainly Irish crew aboard the Canada.